Check for races so the trip out is not a waste. Gray's Peak trail starts where Hanna Flats and Grout Bay trails meet on the 2N97Y fireroad. The trail is highly recommended if you want to push a sustained 2.2 mile climb to the top of the mountain for a great view of the lake. 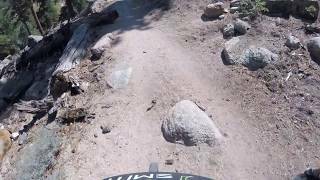 This is an out-n-back only trail, and the descent is one of the funnest in Big Bear with its (mostly) hard packed dirt, good corners, a few technical sections and a handful of fast stretches - virtually all downhill. Enjoy! After you climb and descend Gray's Peak, you can also head out and back to Hanna Flats . Enjoy the return as it is twice as fast as going out. Drop right, roll left...decisions, decisions. Epic natural photo ops abound! Nice flat out sections too! At the top of Gray's Peak -andy meadors.